With two degrees from NYU, Alex Minasian has, at a remarkably young age, established himself as a versatile pianist, educator, and impresario in many different musical genres. 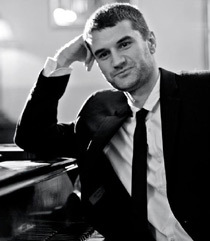 As a pianist, Alex has studied with some of the greatest pianists in jazz history, including Hank Jones, Don Friedman, Jean-Michel Pilc, and James Williams, and has performed in most of the country's most famous jazz rooms, such as Birdland, the Blue Note, Cafe Carlyle, Yoshi's, Bohemian Caverns, Herb Alpert's Vibrato, Iridium, Jazz @ Lincoln Center, and the Apollo Theater. He has shared the stage with such legends as James Ingram, Arturo Sandoval, ?UESTLOVE, Sam Moore, Marylin McCoo, Joe Pesci, Antony Hegarty, Steve Jordan, Mel Carter, Lenny Welch, Curtis Fuller, Hank Jones, and Clark Terry, and with such jazz greats as Brian Lynch, Billy Pierce, Sheila Jordan, Gary Bartz and Hugh Masekela. Alex was the last pianist for the late iconic singer and NEA Jazz Master Little Jimmy Scott, and is the pianist and musical director for the renowned jazz singer Mark Murphy, and performs as pianist and musical director for singer, actor, songwriter, and musical historian Billy Vera and his 18-piece big band. Alex has also headlined such important jazz celebrations as the Rochester Jazz Festival appearing as co-leader of a trio with Canadian bassist Brandi Disterheft. In 2013, Minasian, Disterheft, a veteran drummer Steve Williams (Shirley Horn), formed the Hanky Panky Trio to honor Hank Jones..The Hanky Panky trio is featured in Season 2 of the hit Netflix show, 'Orange Is The New Black'. They have performed at the Montreal Jazz Festival with Sheila Jordan, and as a trio at the Istanbul Jazz Festival. Minasian's trio has a weekly residency at the Iconic New York Restaurant Tavern on the Green. Alex has been featured in Yerevan Magazine, a Los Angeles-based Armenian publication promoting Armenian news and culture.